Describe the basic concepts of core training including the abdominal brace, common training errors, and how to gain your client's trust. Describe 5 Core Restore steps for progressing core training exercises. Explain 3 inner core and 3 outer core assessments for your clients. Discuss the benefits of plank exercises and describe the 5 Plank Principles. Discuss standing strength training and explain how to teach 2 standing strength exercises. 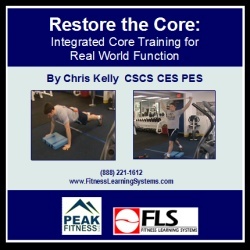 Explain how to safely and effectively perform 3 inner core training exercises and a dynamic warm up. Explain how to safely and effectively perform 4 antirotation and 4 antiextension standing core exercises. Explain how to safely and effectively perform 3 outer core training exercises.